The 2 seater was later supplemented by a larger, usually 4 seater with a scaled up V-Twin 2 litre 12-18hp engine and in 1908 in time for the motor show another 2 seater 10hp was introduced. Just before the First World War the "17hp" was launched using a brand new 4 cylinder 3 litre engine , production of this model continued until 1921. The 1919 motor show saw the launch of a new 11hp car sporting the now famous V shaped radiator and diamond badge, it was this model that was first marketed with the slogan "As old as the industry, as modern as the hour". Up to 1926 2 engines were used, the 10.8hp and the 11.9hp before being superseded by the now famous "Riley 9" series. The Riley 9 "Monaco" started full production in 1927 and caused quite a stir with its closed in fabric covered bodywork with integral rear boot and new overhead valve engine. Later in the year 3 variants arrived, a 2 seater tourer with dickey seat, a 4 seater saloon called the "San Remo" and the sporty 80MPH "Brooklands".During 1928 this range was dramatically improved with 5 new body types, the "Lulworth", "Midworth", "Grangeworth", "Chatsworth" saloons and the "Wentworth Coupe" all with a revised engine. At the end of 1928 the "9 Biarritz" was introduced and the old side valve 12hp was replaced by a new 14hp 6 cylinder 14/6 range which was basically a larger version of the "9", the models included the "Stelvio","Deauville saloon" and the "Special Tourer". Only 1 new model was launched in 1929 - the "14/6" light saloon this helped them achieve sales worth over £1,000,000 for the first time. 1930 saw the introduction of the 9 Plus range - the "Monaco","Biarritz" saloons and the "Brooklands Sports","open Tourer" and "2-seater Coupe", the 14/6 was improved with the 6-light being renamed "Alpine". The founder William Riley was 80 in 1931 the year the "WD or Army Tourer" was introduced, this being a civilian version of the War Office Riley 9 tourer. The 1932 range of cars consisted of 9 cars - the "9" range of "Monaco","WD","Brooklands","Gamecock Sports","Ascot Coupe", and a 2 and 4 seat tourer and 2 X 14-6's the "Alpine" and "Stelvio". 1932 saw the first official cars exported by the company although many had already been built abroad under licence using Riley supplied parts. The "9" range now included the "Kestrel"and "Falcon" 4-seater saloons, "Lynx" 4-seater tourer, "Linock" 2-seater coupe, "March Special" and "Trinity" tourer, the "Winchester" and a 5-seater limousine the"Edinburgh" were added to the 14/6 range. Many improvements to the range occurred in 1934 but only 1 new car the "Imp", a 2-door, 2-seater sports tourer, a long overdue replacement for the "Brooklands". All the fabric bodied cars had now become "all metal" and testing had started on the "MPH" which was basically a 6 cylinder 2-seat "Imp". 1935 saw a completely new "Falcon" and a modified "Kestrel" and 2 new engines - the 12/4 which replaced the 12/6 and the 15/6 which replaced the 14/6. The 1936 range consisted of 23 cars some of which were "Specials" - standard models with uprated engines, suspension and gearboxes but also included a modified "Falcon" and the new "Merlin", the 12hp "Mentone" and the all new 85 MPH "Sprite", a 2-seater streamlined sports car with a "12/4" engine. Also available was a not very successful V-8 engine - the 8/90 Autovia, of which only about 25 were made. 1937 saw the "Kestrel 9" and 12/4 discontinued to be replaced by the new "Monaco". The only completely new car was the "Continental Touring Saloon". A new 2.5 ltr engine was also now available, called the "Big Four" for use in the "Kestrel" and "Adelphi" amongst others and replaced the unsuccessful V-8. The November AGM saw the first hint of financial troubles and in early 1938 the chairman Victor Riley was forced to call in the receivers - The beginning of the end!!! The motor show saw the unveiling of 1 new model the "9hp Victor" the cheapest car in the range, the others all now having a vertical grill over the honeycomb radiator, bumpers and steel covers over the spare wheel. Lord Nuffield bought the company in September 1938 for £143,000 and immediately sold it to Morris Motors (for a reported £1.00) which soon became the Nuffield Organisation - a combination of Morris, MG, Wolsley and Riley. This became BMC (British Motor Corporation) in 1952 upon the merger with Austin and later became BMH (British Motor Holdings) then BLMC (British Leyland Motor Corporation Ltd.) and then British Leyland, renamed again in 1986 to the The Rover Group and then to MG Rover which went into administration in 2005 and it's key assets sold to the Chinese firm Nanjing, bringing an end to mass car production by a British owned manufacturer. By 1939 the range of cars had been trimmed to only 2 - the best selling "Kestrel Saloon" and "Lynx Tourer" which now used as many standard Morris parts as possible. The outbreak of the 2nd World War saw production turned over to war materials. Approximately 57,000 car had been produced up to this time, the vast majority being "Nine's". Percy Riley died aged 58 in 1940 and the founder William died in 1944 aged 93. As soon as the war ended a new design - the RM series was launched, the "RMA" being of modern design compared with most other manufacturers 1939 designs but using the old pre war 1.5 engine, 1946 saw the 2.5 "RMB" launched and by 1949 with production now moved to Abingdon the "RMC" and "RMD" aimed at the export market to America but poor sales saw them being dropped after a run of only about 500, this short run has made them quite rare. Another milestone in 1952 was the formation of BMC. 1953 saw the new "RME" and the 2.5 ltr "RMF" launched but sales of this model were slow so it was soon replaced by a variant of a Wolsley the "RMH - Pathfinder" the "missing" RMG model never materialised, the Pathfinder was replaced by a similar car the "2.6" which was almost a "Wolsley 6/90" with a Riley badge. Another 2 models - the "1.5 Farina" or 4/68 and the 1622cc 4/72 were basically an "Austin Cambridge " with a Riley badge. The BMC "Riley 1.5" was very successful with over 30,000 sold, the "Mini" "Riley Elf" was another good seller. The last in the range the "1300" "Riley Kestrel" along with the rest ceased production in 1969 and Riley were no more. 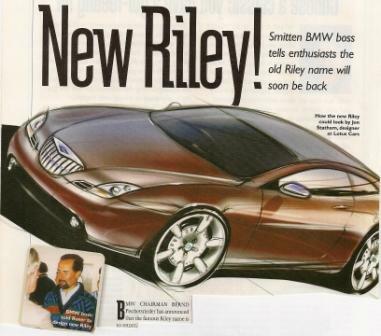 The Riley name is now owned by BMW and rumours of a new model circulate from time to time so one day we may see the marque revived especially as reported in Classic Cars magazine September 1998, during a dinner hosted by the the Association of Riley Clubs to celebrate the centenary of the Riley marque, the BMW chairman Bernd Pishetsrieder made a surprise statement saying that the famous Riley name is to return. To cheers from the audience he went on to say he was instructing Rover Engineering Director Nick Stephenson to start work immediately on a new car (needless to say it is now 2018 at time of writing and no new Riley has appeared!). Below is a suggestion of how the car would look according to the magazine.